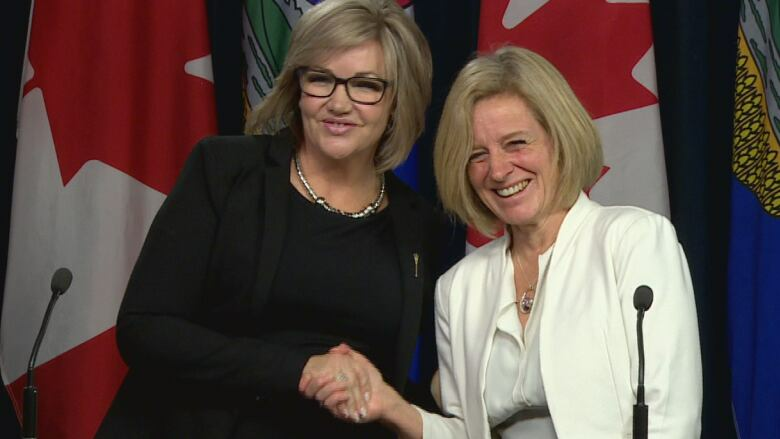 Calgary-North West MLA Sandra Jansen crossed the floor to join the Alberta NDP caucus on Thursday, nine days after she dropped out of the PC leadership race. Jansen said she joined the NDP because she wanted to be a legislator again and to work as a member of what she described as a reasonable, pragmatic government. "I don't believe that there has been anything moderate or pragmatic being offered or even discussed by the people intent on taking over the Progressive Conservative Party of Alberta," Jansen said, a dig at leadership candidate and former federal Conservative MP Jason Kenney. Jansen said Premier Rachel Notley's NDP government, not the PC party that was ousted from power in May 2015, now carries on the legacy of former Conservative premier Peter Lougheed. "To see that legacy being kicked to the curb by extremists who are taking over the PC party has been heartbreaking to me," Jansen said. "The tone that is being brought into Alberta politics belongs in our past." Jansen abandoned her leadership bid on Nov. 8 after alleging she was harassed and intimidated by volunteers from another candidate's campaign. Donna Kennedy-Glans also dropped out that day, which left no women in the race. "I said last week that Tuesday was a bad day for women in Alberta," Notley said Thursday. "Today is a much better day because a strong, articulate, mainstream, progressive woman is joining the government of Alberta." Jansen was first elected in 2012 and served as an associate cabinet minister under former premier Alison Redford. She was one of nine PC MLAs who were elected when the NDP victory in May 2015 ended the party's 44 years in power. Jansen said she no longer felt welcome in the PC caucus and said there were MLAs who didn't want her there. In the hours after she announced she was leaving the leadership race, a dozen NDP MLAs left messages for her. She said she didn't get a single call from her caucus. Jansen has long described herself as fiscally conservative and socially progressive. Asked how her views would fit with the NDP, Jansen said she has been told all voices are welcome at the table. "I've been told the tent is big enough for me," she said. "In my mind, I consider myself to be centrist." Moments after Notley announced the floor-crossing, Progressive Conservative interim leader Ric McIver issued a statement wishing Jansen well "in her new role" within the government. "Sandra has been a valued member of our caucus, and we know that the government will benefit from her sharp intellect and passion for serving Albertans," McIver said. McIver later told reporters that he learned of Jansen's departure after the media found out. "Life is what it is, and I've learned to roll with the punches," he said. "And to deal with situations as they present themselves, which isn't always as I would prefer them to present themselves." In an interview with CBC News, Kenney wished Jansen well but said he wasn't sure the NDP's views are in line with those held by her constituents. "I can't say I'm entirely surprised because her voting record in this legislature indicated she voted with the NDP government almost as often as she voted with her own party on fiscal matters," he said. "Maybe this is an inevitable realignment of her own views as expressed in her votes." Jansen's switch gives the NDP 55 of 87 seats in the legislature and leaves the PCs with eight. The legislature resumes its fall sitting on Monday. Kennedy-Glans, who dropped out of the PC leadership race the same day Jansen did, said she was frustrated by the limited chances for centrist voices like her own to be heard. Shortly after Jansen announced she was joining the NDP, Kennedy-Glans said she won't change her political allegiance. "Don't worry," she wrote on Twitter. "No risk that this fiscal conservative will be joining the @abndp any time soon!! #never."